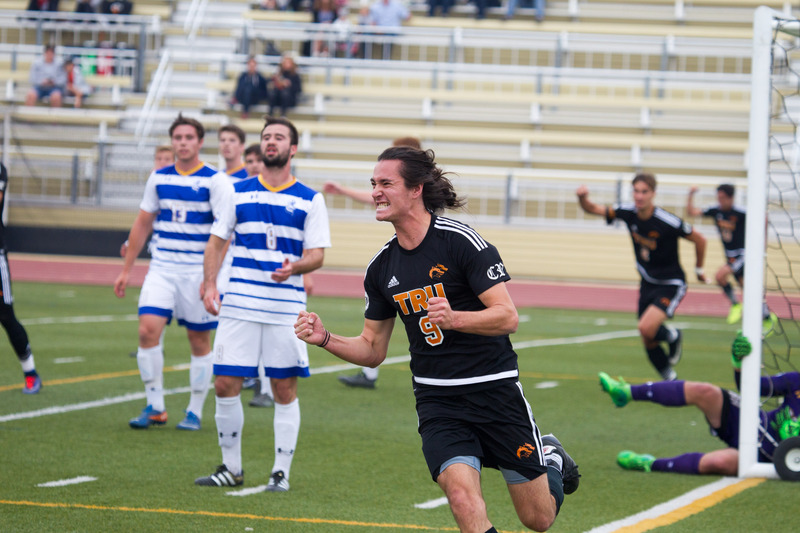 The WolfPack men’s soccer team continued their unbeaten streak with a confident 3-1 display against the University of Lethbridge Pronghorns at Hillside stadium Sunday. This win extended the team’s unbeaten streak to five games. The match was one-sided, with TRU taking 12 shots on goal to Lethbridge’s zero. The player-of-the-match was James Fraser, a second-year student from Penticton, B.C., who earned the honour by scoring twice, both from set plays, and assisting for the team’s third. The game took a turn for the better for the WolfPack team and in Lethbridge’s case, a turn for the worse, when in the 51st minute, Lethbridge midfielder Sean Gaiskey, was given a red card after colliding with WolfPack defender Finlay McPhie. This left Lethbridge with 10 men for the rest of the match, which wasn’t ideal given they were already 1-0 down in the contest. In the 61st minute Fraser would score his second and Anatoli Leville, a first-year student from Winnipeg, who is only 16 and the youngest player in U Sports soccer, later scored in the 78th minute to put the game out of reach for the Pronghorns. Lethbridge would manage a consolation goal when Dominique Point du Jour scored a 90th-minute penalty after Fraser, who played a massive role in this game, had a hand ball. As consolation goals always are, it was a little too late for Lethbridge and the WolfPack team had done enough to prolong their unbeaten run. WolfPack’s defence was rarely tested with the keeper not having to make a single save and Lethbridge not having a single corner throughout the entire game. After the game WolfPack Coach John Antulov said he was satisfied with the performance but still felt they could have capitalized on more of the opportunities that were created throughout the game. There was also a sense of joy on being able to capitalize on set plays, which can always prove vital in tough games. The mood in the WolfPack camp is very positive now with results and performances being good. Improvements can still be made but right now it’s safe to say that the team is going in the right direction. Their current record stands at 3-1-3, which shows that the TRU WolfPack soccer team is very competitive. The hope would be that they continue racking up more wins in coming games, especially against teams with better records, with all due respect to Lethbridge, who currently have a 1-5-2 record.